1. Preheat the oven to 220ºC/Fan 200ºC/425ºF/Gas Mark 7. Place the mushrooms, gill-side up, in a single layer on a large baking tray. Drizzle honey and some seasoning over the mushrooms. Bake in the oven for 5-10 mins or until the juices have begun to run. 2. Brush the mushrooms with any juices which have run out into the tray, then top each with the sliced cheese. Return to the oven and cook for 2-3 mins or until the cheese is melted and pale golden. 3. Meanwhile, place all the pesto ingredients together in a blender and whiz until smooth. Add a little water if you prefer a runnier pesto. 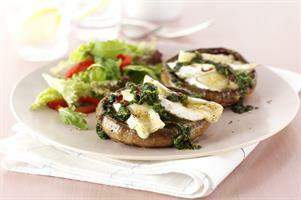 Arrange the salad on four plates, add the cheese topped mushrooms and drizzle a little pesto over each. Serve immediately with crusty bread.